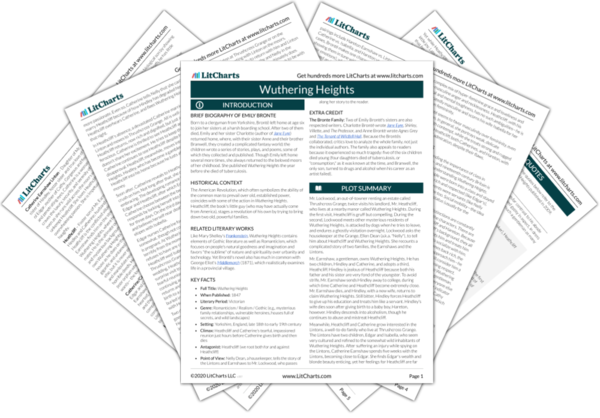 Welcome to the LitCharts study guide on Emily Bronte's Wuthering Heights. Created by the original team behind SparkNotes, LitCharts are the world's best literature guides. A concise biography of Emily Bronte plus historical and literary context for Wuthering Heights. A quick-reference summary: Wuthering Heights on a single page. In-depth summary and analysis of every chapter of Wuthering Heights. Visual theme-tracking, too. Explanations, analysis, and visualizations of Wuthering Heights's themes. Wuthering Heights's important quotes, sortable by theme, character, or chapter. 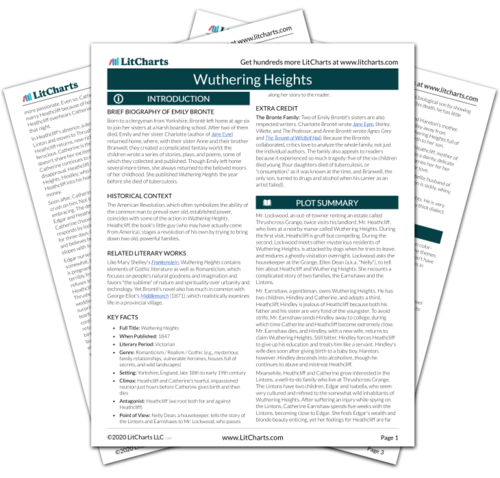 Description, analysis, and timelines for Wuthering Heights's characters. Explanations of Wuthering Heights's symbols, and tracking of where they appear. An interactive data visualization of Wuthering Heights's plot and themes. Born to a clergyman from Yorkshire, Brontë left home at age six to join her sisters at a harsh boarding school. After two of them died, Emily and her sister Charlotte (author of Jane Eyre) returned home, where, with their sister Anne and their brother Branwell, they created a complicated fantasy world; the children wrote a series of stories, plays, and poems, some of which they collected and published. Though Emily left home several more times, she always returned to the beloved moors of her childhood. She published Wuthering Heights the year before she died of tuberculosis. The American Revolution, which often symbolizes the ability of the common man to prevail over old, established power, coincides with some of the action in Wuthering Heights. Heathcliff, the book's little guy (who may have actually come from America), stages a revolution of his own by trying to bring down two old, powerful families. Like Mary Shelley's Frankenstein, Wuthering Heights contains elements of Gothic literature as well as Romanticism, which focuses on people's natural goodness and imagination and favors "the sublime" of nature and spirituality over urbanity and technology. Yet Brontë's novel also has much in common with George Eliot's Middlemarch (1871), which realistically examines life in a provincial village. Point of View: Nelly Dean, a housekeeper, tells the story of the Lintons and Earnshaws to Mr. Lockwood, who passes along her story to the reader. The Bronte Family: Two of Emily Brontë's sisters are also respected writers. Charlotte Brontë wrote Jane Eyre, Shirley, Villette, and The Professor, and Anne Brontë wrote Agnes Grey and The Tenant of Wildfell Hall. Because the Brontës collaborated, critics love to analyze the whole family, not just the individual authors. The family also appeals to readers because it experienced so much tragedy: five of the six children died young (four daughters died of tuberculosis, or "consumption," as it was known at the time, and Branwell, the only son, turned to drugs and alcohol when his career as an artist failed). Skinner, Sally. "Wuthering Heights." LitCharts. LitCharts LLC, 22 Jul 2013. Web. 13 Jan 2019. Skinner, Sally. "Wuthering Heights." LitCharts LLC, July 22, 2013. Retrieved January 13, 2019. https://www.litcharts.com/lit/wuthering-heights.